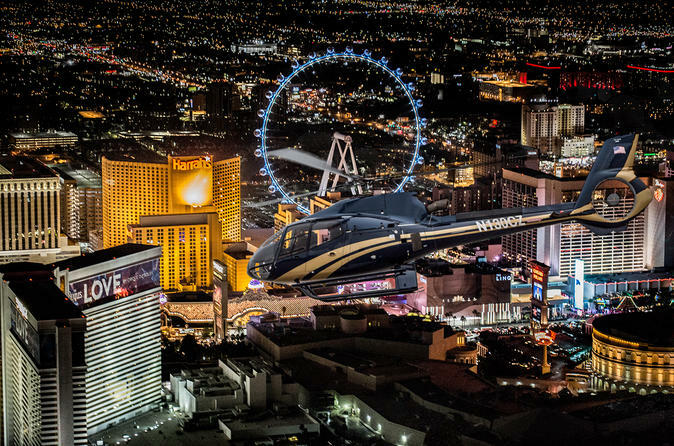 Soar above the glittering lights of the Las Vegas strip during this 15-minute helicopter flight. Gaze out the EC-130 helicopter's window at the views while flying over a course of about 25 miles (40 kilometers) while listening to your pilot's commentary through a headset. Highlights include the Strip's mega-resorts, Fremont Street, and Downtown Las Vegas. Upon landing, sip an included glass of sparkling wine and walk away with a souvenir photo of your trip. Please note: The listed price does not include a $15 per person airport and fuel fee, payable at the time of tour check-in. Flights are scheduled based on total number of passengers. Exact flights times will be advised upon reconfirmation with the local operator. Due to comfort and weight / balance of the aircraft, passengers weighing over 250lbs (112 kg/ 17.85 st) will be required to purchase an additional seat. This is payable directly to the tour operator on the day of the tour.